Egypt: The military men ruling in Cairo since 1952 took it askance when Hosni Mubarak prepared the way for his banker son Gamal, to succeed him. Yemen: Ali Abdullah Saleh filled the government with relatives and wanted his son Ahmed to succeed him, an aspiration that aroused opposition, especially from the tribes. Libya: Mu'ammar al-Qaddafi's seven sons, some of which hoped to follow him, feuded among themselves and exacerbated hatred for the regime. Syria: Hafez al-Assad did succeed to have his ophthalmologist son Bashar succeed him, only for Bashar's ineptitude to prompt the regime's worst crisis ever. In addition, Saddam Hussein of Iraq worked assiduously to have his sons succeed him, which contributed to his vanity, misrule, and ultimate demise. 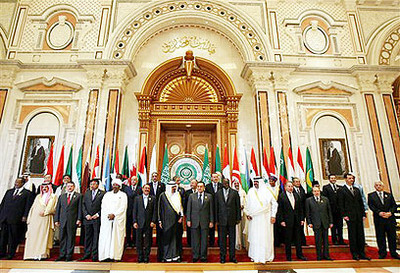 Arab leaders in their glory, at an Arab League meeting in Riyadh, Saudi Arabia in 2007.